T/T stands for Telegraphic Transfer. In other words, an international wire of funds from the buyer’s bank to the seller’s bank. 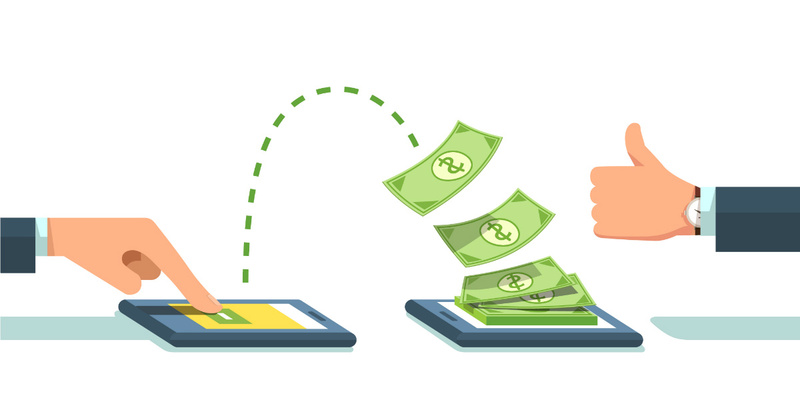 A wire transfer based on SWIFT is the most common payment method in international trade with Asian countries. It typically takes 3-5 working days to clear, and generally costs between 25 and 50 USD, depending on your agreement with the commercial department in your bank. 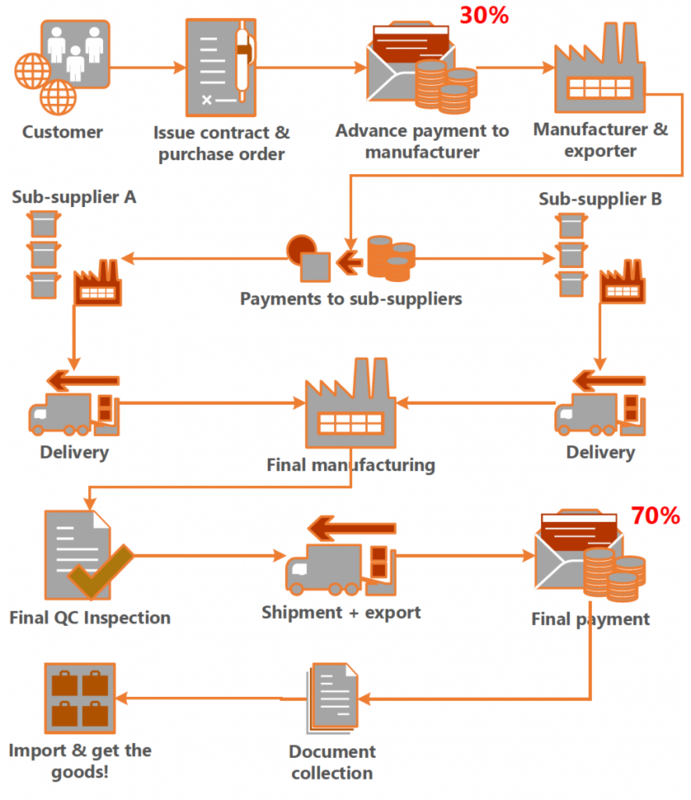 What is the most common payment term requested by Chinese suppliers? You have the supplier develop sample(s) until you are confident they know exactly what you want. You send a 30% deposit (by T/T) before production starts. 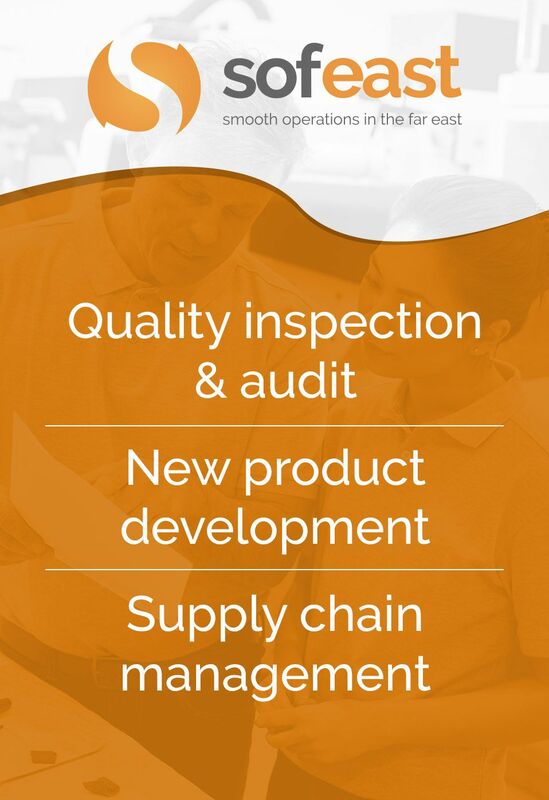 You work with a quality assurance firm to inspect product quality (this is optional but usually a good idea). You send the remaining 70% (by T/T) before shipment. What is another common, and better, payment term? It is quite similar, except for the end of the process. The buyer knows the goods have been shipped out before paying the remainder. The supplier knows the buyer can only take possession of the goods after the original bill of lading has been sent. Can you negotiate this term? If you insist on it from the very start, and if your suppliers are motivated to work with you, probably yes. If you come out as a beginner and your orders are very small, probably not. How to do a T/T payment? Contact the commercial department of your bank, tell them you need to wire (for example) 25,000 USD to a company in China, and they will generally give you a form to fill out. If you do T/Ts frequently, your bank probably has an ‘internet banking’ application that will save you time. After you have done this, take a screen shot, or get a digital copy, and send it to your supplier. Make sure to avoid any misspelling, which might cause the payment instruction to be held in limbo for weeks! You will need to write the company name in English, not in Chinese. Don’t try to do your own translation job, even if your written Chinese is excellent! It has to match exactly the English name under that is registered in the seller’s bank records. How to negotiate better payment terms? There are various ways you might be able to negotiate for payment of some (or all) of the amount after shipment. Your company is well established and famous — think Apple or Disney. The risk of the buyer’s company defaulting is much lower. And the seller want to boast about that prestigious customer in order to get more business. You arrange financing of your suppliers — as the buyer, if you have relatively strong financial guarantees and you purchase more than 1 million USD a year, you can work with a company (or a bank department) specializing in trade assurance solutions. Your supplier gets the cash when they need it, and your account is debited much later. You have a buying office in China — having a strong presence in-country does help. A supplier that hasn’t been paid in time can pay you visits and take different measures to push you for faster payment. What are some mistakes we should never make? The supplier says they need a deposit earlier to buy one of the components, which needs to be ordered 3 months in advance. Is it true? It might be true. Yes, it does happen. If possible, get all the information about that supplier, their product price, and so on. In that case, you can usually negotiate the amount to pay at the time of that purchase. It is not necessarily 100%, but often is. And make sure you understand how much you will still need to pay later for the advance payment (before production). Are there common scams that we should be aware of? Yes! Some hackers regularly collect payments from buyers who send wires to the wrong accounts. You can read 7 tips to avoid this scam here. Our supplier asks for payments to be wired on a personal account. Is it a problem? Ask for an invoice that calls for payment to their company account. If you send money to a personal account, it will be much more difficult to litigate against them if they let you down later. The amount of the purchase is very low (for example, 1000 USD), and it makes no sense for them to do all the paperwork for converting your USD into RMB and so on and so forth. They don’t want to declare it in order to avoid taxes. This is not reassuring, but it is still very common in China. Don’t expect this company to be a perfect supplier over time. Our supplier asks for payments to be sent to a different company. Is it a problem? Not necessarily. Again, there might be several reasons. They might use a Hong Kong company to avoid declaring the sale in China (and pay taxes), they might not have an export licence, and/or they might find it much more convenient to collect payments and do all the export procedures under another company. As I wrote above, this will make it harder for you to litigate against your supplier, since you won’t be able to show a trail of payments from your company to theirs. What can you do? The very minimum is for you to ask both companies (your supplier — “A”, and the one collecting payments — “B”) to jointly sign and stamp on a declaration that B is collecting payments on behalf of A and that A is the supplier to your company. How to do when an Alibaba supplier asks for payment by TT? Whether you found them on Alibaba, Global Sources, Made In China, or other similar directories, doesn’t change anything. If you pay them by telegraphic transfer, what I wrote above in this article applies. Should we issue a purchase order? It is considered as a contract? At the very minimum, your supplier will send you their pro forma invoice and ask you to confirm it. Naturally, it comes with their own terms, which is why we suggest you issue your own purchase orders (POs). However, a PO is not a contract. It is difficult to sue a rogue supplier on the basis of a PO. We are not legal specialists, but the China Law Blog covered the topic of contracts nicely in this post. Should we pay suppliers in USD or in RMB (China’s currency)? Both are usually fine (up to negotiation between you and them). The “standard” is to pay in USD, but more and more buyers have decided to remit RMB. This might make sense if your bank offers that possibility. I wrote here about the reasons why many companies pay their Chinese suppliers in RMB. Do you advise using the FOB incoterm, when shipment is by sea? If you purchase products from a Chinese company, do like most other buyers — buy under the FOB (“Freight On Board”) incoterm. It means you appoint the freight forwarder (or directly the shipping line) that will handle international transport. As we suggested above, you don’t want the supplier to ship the goods before a final quality inspection has taken place. If you buy FOB, the shipment can only take place after your freight forwarder has released the “shipping order” to your supplier. You can find more information on this topic in this post about negotiation. Our bank charges us a lot for an international wire. Is there a cheaper alternative? If your bank charges you 40 USD or more, and their transfers take 4-5 working days to be executed, you are working with a traditional bank that follows an antiquated system (SWIFT was developed in the 1970s). This should change in the coming years with cryptocurrencies such as XRP, but right now there are other solutions. Can a bank wire transfer get “lost” in the system? Depending on the two banks’ reactivity, unlocking such a situation can take up to 2 months! 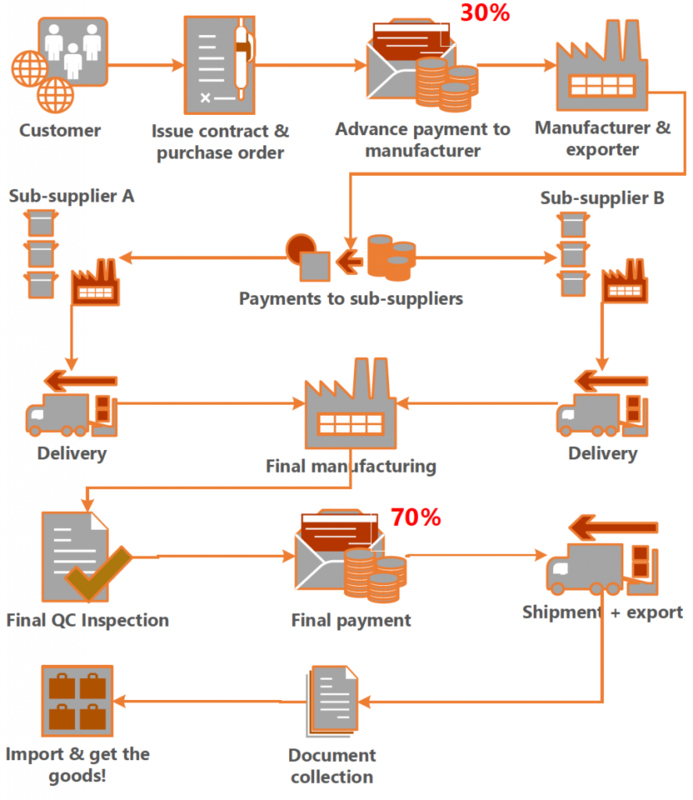 Why do suppliers in China, Vietnam, or India always want payment before we get our products? They know that it is a “standard” and they suspect that you, as the buyer, will have a hard time finding a better deal. They need cash to pay their suppliers who, for a good part, don’t extend any credit. Can the amount of the deposit (before production) be negotiated down? If the supplier sees your project as interesting in the mid- to long-term, and if the manufacturer has sufficient cash on hand to order and pay the components, yes it is generally negotiable. If your production is highly customized and (in the unfortunate event of an order cancellation) difficult to sell to another customer, negotiating a lower deposit will be difficult. It is a measure of risk prevention. Do all component suppliers need payment in advance? Some do if they don’t have any confidence, but extend credit (generally 10-30 days, or enough time for the assembler to complete production and ship the goods out) when they feel the risk is limited. Our supplier asks us to pay all the remaining 70% before they ship the goods. Is it dangerous? This is unfortunately quite common. Generally speaking, if you have had a quality assurance agency confirm the quantity and the quality of your goods, the risk of paying before shipment is relatively low. Few companies scam their suppliers after doing all the production. Can we negotiate for 100% to be paid after we receive the goods? *Editor’s note: This post was originally published in 2012, and his since been updated to include new information and formatting. I am learning about another alternative called “Escrow” payments, such as what Alibaba.com offers. I have not used it but my research suggests that it is an option that is more secure than T/T and less expensive than L/C. The drawback is that both buyer and seller must sign up with Alibaba.com. Any comments on them? I am an online seller and use alibaba for some supplies. The escrow method they use is the seller doesn’t get your money until you receive the goods and release it (on Aliexpress anyways). They operate on a feedback system much as ebay and has a buyer protection clause that so far has worked ok for me but is not foolproof. The sellers have no incentive to not send your goods. Do not make the mistake I made and pay by Western Union ever. My small company lost $500 from a Chines sham company with a fake pretty website that doesn’t ship anything. I agree that Aliexpress’ system is a vast improvement over Western Union payments. Please POST the scam website!!! Escrow payments might be fine for small amounts, and if you don’t have duties to pay. Be aware of the risks, though… I advise you to read http://www.qualityinspection.org/alibaba-fraud (the article, and also the comments). If you don’t want the goods to “leave port” before you get paid 100%, then you need to collect 100% of the payment before you bring the goods to the port. HI THERE.. IM IN THE PROCESS TO BUY TIRES FROM CHINA HOW CAN I VERIFY THE COMPANY AND THE BACKROUND? AND HOW CAN I FIND A COMPANY TO INSPECT MY TIRES BEFORE THE SHIPPED? Hello Sir, please i need your advice , i am ordering a goods from China and they are dealing with TT payment method, how can i make sure to secure the shipment because i deal only with LC payment method, and if you know inspector company to deal with to inspect the goods before shipping. This is a bit off the topic but I want to find out if a chinese supplier is legit. how do I go about doing that? I am going to contact you. Can you contact me with these details also? Thank you in advance. If the supplier says they are a manufacturer, my company can audit their factory — contact me at ra[at]sofeast.com. If the supplier says they are an agent but they will sell the goods themselves to you, you can use the services at http://www.chinacheckup.com. If you need to check the products before shipment, again my company can help and you should contact me. I too want to find out if a chinese supplier is legit. how do I go about doing that? the company name is Guangzhou Lifeng Printing Co., Ltd.
You can do this at http://www.chinacheckup.com in an economical way. Or we can audit the factory (if they are the manufacturer, and not a trading company) and tell you what they make, how organized they are, what processes they have in house, etc. Hi , we are planning to start the registered office in xiamen for selling the raw granite blocks , your concern support for the same . I to would like to know the answer to that question. I know I could fly over and check but that seems a bit much. Could you please share the info with me as well? I am in the process of buying some goods from China using Alibaba and I have no clue how to do the background check. I would like to no if this company am dealing with really exist shuntong group Co limited. is JUN ZUO . B.D manager of no. +86-159-64983783 really work for this company.